· The four basic coat colours are tawny/ruddy, cinnamon/sorrel,blue and beige fawn, plus these four colours in the silver range(ie Black Silver, Cinnamon Silver, Blue Silver and Fawn Silver). · With the silver colours, a gene inhibits the base coat colour, leaving the ticking on a white undercoat. · the coat takes around two years to develop completely, ie to achieve a fully ticked, ruddy brown or reddish colouring. · they get along well with other animals icluding other cats as well as dogs. · thrive on human companionship and therefore a second cat for company should be considered if you have to leave them for long periods of time. · many Somalis are fascinated with water and love to play with a dripping tap, or simply drink from it. · Renal Amyloidosis or RA - the disease causes fibrinous build up on internal organs which will eventually shut them down. Difficult to diagnose and there is no known cure. Not only affects Somalis and Abyssinians, but other cats and humans. 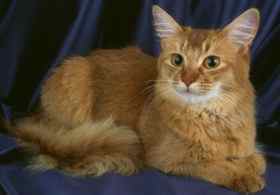 · Myelodysplasia- known to affect humans but only recently found in a Somali Cat. Not much is known at this time about this disease. Responsible breeders avoid working with bloodlines with these potential problems and many offer a genetic guarantee on their cats and kittens.